Published by almostaghost on January 1, 2012 in almostaghost and mixes. 0 Comments Tags: 2011, 2011 countdown, England, Kate Bush. Kate Bush! After a six-year absence, she put out two albums in 2011. 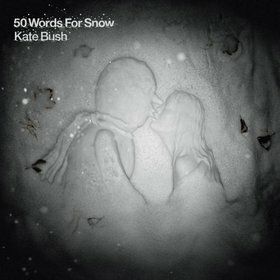 While the first, Director’s Cut, was a relatively useless re-imagining of songs from two of her older albums, 50 Words For Snow included all new material. One difficulty here is that if I were to explain these songs as ideas, they almost all would sound gimmicky. A song about a snowflake falling? A passionate night with a snowman? A song with 50 words for snow in it? Yetis? These sound kind of silly. Kate Bush, however, is a scientist. These are actually songs about snow. Snow is not just in the background or an atmospheric detail. By using snow so intimately in the songs, looking at it so closely, Kate Bush ends up discovering ideas and metaphors within. 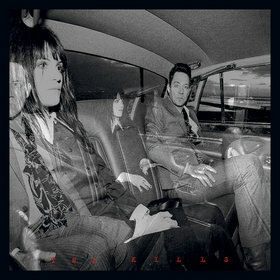 The heavy “Lake Tahoe” uses a similar arrangement, Kate again at her piano with gentle drums. Instead of snow lightly falling, it feels darker and stronger and colder. A male opera singer harmonizes with her a bit, but she sings most of this ghost story, about a woman who drowned and froze in Lake Tahoe, leaving her dog behind. Later on “Snowed In At Wheeler Street,” Bush duets with Elton John. A lot of artists might write tragic romance songs, but only Bush would take “Wheeler Street” into such fantastic fantasy. Instead of being cliched, “love lasts forever,” she writes of lovers finding and losing each other throughout time (from ancient Rome to World War II to 9/11 in New York). “Misty” begins with her building a snowman, who then follows her into her room. He lies down next to her, “his snowy arms surround me / so cold next to me / I can feel him melting in my hand.” Only Kate Bush could get away with this, and like on “Wheeler Street,” she takes the story all the way. “The sheets are soaking and on my pillow / dead leaves and bits of twisted branches.” Her lover melts away, leaving her hopeless. “Wild Man” and “50 Words For Snow” show Kate Bush’s linguistic skills. “Wild Man” looks at the myth of the abominable snowman, and how it shows up all around the Himalayas. “From the sherpas of Annapurna / to the rinpoche of Qinghai / Shepherds from Mt. Kailish to Himachel / found footprints in the snow,” she informs, clearly enjoys weaving the names of mountains and Tibetan words into her song. “50 Words For Snow” is just that, a song with exactly 50 words for snow, few of which you’ve ever heard before (“faloop’njoompoola,” “spangladasha,” “anklebreaker,” “vanilla swarm,” “icyskidski,” “sorbet deluge,” “boomerangablanca,” “bad for trains,” to name a few). Bush’s last album, Aerial, was a 2-disc set. The first disc was more typical verse-chorus songwriter songs, while the second was a thematic operatic piece of music, lacking in choruses, and all the songs flowed together. It is one of my favorite pieces of music ever. That one used the sea as a theme, and was lively and intense. In contrast, 50 Words For Snow is more of a shapeless snowdrift than a sea of waves. The songs may be just as intense, but in a much softer way. The end result is very similar: yet another gorgeous, glorious album. Published by almostaghost on January 1, 2012 in almostaghost and mixes. 0 Comments Tags: Goldfrapp, Little Dragon, Low, Mia Doi Todd, Radiohead, The Flaming Lips, The Handsome Family, TV On The Radio. Last 8 days, in mixtape form. I fell behind on my reviews and won’t be quite done for the new year. I hate to linger on too long after January 1st, so I’ll get the last five albums up and done (and a nice long mix) in the next couple days. Have a good New Year’s! Thanks for reading, on behalf of everyone at this blog.